Join five animal friends as they start school in this delightful introduction to the preschool day, from getting dressed in the morning to home time. 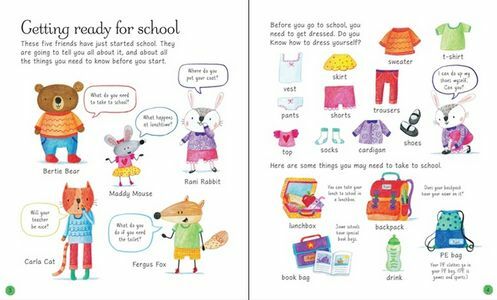 Charming illustrations describe the school day and some of the early years concepts children will learn, including colors, numbers and counting, getting dressed, seasons and more. This book will be a great help at improving the readiness of every child before they have their first day at preschool. Also suitable for use pre-kindergarten to check that your child has the skills expected upon entering a kindergarten class. Heavy card stock pages make this suitable for use with children as young as 2. 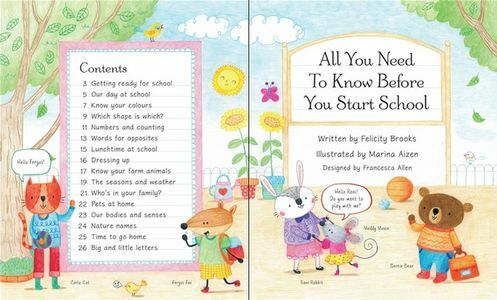 This book is packed with so much great info for little ones who are getting ready to start school or even those who aren't quite ready or have already started! It's got colors, shapes, numbers/counting, letters, body parts and senses, seasons and weather, opposites and more! It also has things to expect during your day at school such as recess, lunch, dress up time and even time to go home! Felicity Brooks is an Editorial Director and writer at Usborne Publishing. She studied English and Drama at Exeter University and worked as an actor, teacher and lexicographer before starting work in children's publishing in the late 1980s. She has written and edited hundreds of children's titles, including stories and novelty books for pre-schoolers and books about history, geography, languages, science, maths, nature and the arts. Her books have won the TES Senior Information Book Award, the Aventis Science Books Prize, the SLA Information Book Award, the Sheffield Baby Books Award and Practical Pre-school Gold and Silver Awards.